This year, for the third year in a row, I participated in the Fjällräven Classic USA here in Colorado. Read about the 2016 USA Fjällräven Classic and the 2017 USA Fjällräven Classic. As with previous years, this was a 3 day, 2 night backpacking trip in the Colorado backcountry, hosted by Fjällräven and their sister brands. This year felt like they are really hitting their groove with organization, distance, and difficulty, and I think it was overall the “best” one yet. Erika came along this year as well, and we did a lot fewer training hikes because we knew the course was significantly shorter, had both been really active all year, and were generally just pretty confident. We were also busy getting organized to get married (which happened the week after the Classic! ), and I was breaking in a new mountain bike, so we had some other things on our schedules  Nonetheless, we got in a few training hikes (or rides) at Table Mountain and Aldefer/Three Sisters. This year’s course was significantly shorter than last year’s (thank god). I think the first day was probably too short to be honest, and it left a lot of time at the end of the day to just sit around and… drink too much. That’s partially because we had to start earlier than last year (apparently a requirement of the Forest Service), so the day was just over really early. Day 2 was pretty long, and pretty hard, but there was a lot of variability (compared to last year’s long, hot, exposed slog), so I quite enjoyed it by comparison. I was definitely tired by the end of it though. Day 3 was “all downhill” and quite easy, although it went on a lot longer than expected based on looking at the map quickly. Here’s the entire course, again created on the wonderful Caltopo. Note that these paths are based on trail information stored in their database, so it’s not necessarily exactly where we hiked. One of my friends on the trail said Day 2 in particular was quite different, and actually came out at more like 14 miles. I’m looking forward to tracking this myself using my Garmin watch next year. Distance and elevation breakdowns per day. We were heading up from Denver with my friend Michael, so we had to get a really early start. We arrived at Copper Mountain Resort by about 7am, so that we could get the last bus to the trailhead at 7:30. Once at Tennessee Pass, we got prepped, hit the trail, and made good time for the first day. From memory we got to Camp 1 by about 2pm. The last section (through Camp Hale) was pretty flat, dry, and exposed, plus we were just trudging along gravel roads, so not that great. The rest of the day was nice single-trail through forest though, which was beautiful. Camp was on the grounds of Nova Guides, a snowmobile/ATV rental company based out of Camp Hale. They had a nice (fishing) pond, green grass, and plenty of space for us to all set up camp (either together on the grass, or a bit more dispersed up the hillside, which is what we chose). Our friends Rene and Michelle even had an amazing surprise for us, having lugged in a small bottle of champagne to pre-celebrate our wedding! This was the long one, with all the elevation gain. Out of Camp Hale (early – we left at about 6:30am from memory), we wanted to try to clear the exposed valley floor before the sun got too high and hot. From there it was up, up, up, over Kokomo and Searle Passes, past Janet’s Cabin, and to Camp 2. We stopped for multiple lunches, had a photo shoot with one of the official photographers (it’s very awkward getting close-up video of each cheese and elk sausage), stopped to use the Grayl to get clean water, snapped a bunch of pictures from the amazing views, and trudged into Camp 2 pretty weary, but pretty happy. The last day was a bit of a sleep in, break camp, then head mostly-downhill to the Trekker’s Inn, finish line, and closing party. We managed to intercept an ATV taking some supplies up the trail and snag a beer on the way down, and there were even llamas at the closing party! We carried a small “passport” with us throughout the hike, which was used to keep track of us (stamped at each checkpoint/campsite), and also included a map. It had some details from Leave No Trace and info about sponsors as well. As I mentioned earlier, I think this was the best organized/executed iteration of the USA Classic yet. Before going, I had sort of decided that it’d probably be my last for now, and that I’d go on my own backpacking adventures rather than do this again next year. After going again though, I’m reminded of the fun I have, the great people, and the sense of accomplishment that I think is different in a group setting than it would be on my own (or even with just a few close friends). If the timing works out again, I think you’ll probably see another of these posts from me again next year :). Note on numbers: distances and elevation are from Caltopo, so they’re based on the trail data they have available, for the specific trail that I’ve marked out (which is I think pretty accurate). Steps, calories, and “total distance” per day are from Fitbit, using a Fitbit Blaze throughout the hike. 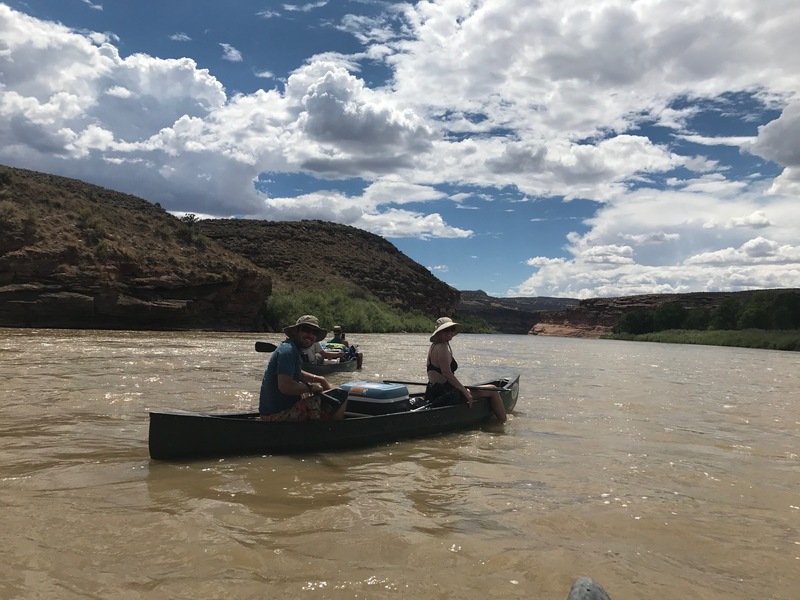 A few weeks ago, Erika and I joined some friends on the Colorado River for a repeat of a trip we took last year. I got all my gear sorted out on Thursday afternoon/evening, then drove out to Fruita (our put-in point) on Friday morning. By noon we were all loaded up in our canoes and ready to hit the water. This year’s highlight was probably the felon we ran into who claimed to be on the run. Seriously. Right when we started, we saw someone putting in on the other side of the river in a yellow kayak. Not too long later he caught up with us, and asked to borrow a phone. His story was confusing and rambling, but he claimed to be on the run from Federal Marshals, and was taking one last river trip before he was put away for 20+ years on a felony “paleolithic” offense, which apparently involved finding and trying to sell a dinosaur bone on federal property. The guy was wearing jeans and runners, and had nothing with him. Our guess is that he stole the kayak and was just making a run for it. Other than our kayaking-felon, we were treated to the same beautiful cliffs and landscapes as we were last year. Some fun mini-rapids and lots of hanging out in chairs in the river, drinking beers. We also briefly saw some river otters on the last day which was a fun treat. The first night’s campsite again turned out to be a rough one, even though we tried a very different one this time. It was super muddy to get in there, and then was again a total mosquito party. We found a spot inland a bit where we could set up a kitchen and hang out to avoid the mosquitos, but then it rained all evening, which made for a pretty muddy and dreary time. The next morning we went on a bit of a hike up into the valley/hills, checked out the scenery, then headed off for the day. Day 2 (the only full day on the river) was a really lazy one, because we didn’t have that much distance to cover. We had a few nice long breaks, including a shot at some fishing and running some rapids in life vests (just laying back and floating them directly in the river). That night we stopped at Black Rocks 3 campsite, which was glorious. We had a beach to ourselves with soft sand, no mosquitos, and ended up with a beautiful clear sky. We lay around and watched the stars, admired the Milky Way, and generally just enjoyed the evening. Since we had a schedule to keep on Day 3, we were up and at it in the morning, and got moving. We got buzzed by a plane while we were packing up (figure-8s in the sky! ), then hit the river. When we got to the boat ramp, our ride was already there so we took out, packed up, and rolled back to Fruita. From there it was a matter of loading everything up, then making the 4 hour drive back to Denver so that we could unpack and clean, organize etc. Another great trip. This week, I’ve been roaming the Colorado wilderness with 250 of my closest/unknown friends, participating in the second annual Fjällräven Classic, USA. I participated in the inaugural event last year, which conveniently fell during my 3-month sabbatical from work. At the time, I said that no matter what else was going on, I would definitely be attending again in 2017. As promised, when the 2017 Classic was announced, I immediately grabbed tickets, and this time even talked Erika into going. Even though I’m stubborn, and had already committed to going, seeing that the trek would be somewhere in the range of 35 miles this time gave me pause. Last time it was more like 22 miles, and although I felt like I handled that pretty easily, 35 was a big step up, and I wouldn’t have the advantage of being on sabbatical and already doing a lot of high-altitude camping/hiking leading up to it this year. After convincing Erika though, we both got our tickets, and accepted that we’d need to train for this, and take it pretty seriously if we wanted to make it through. We were right. In the weeks leading up to the Classic, we went on a series of training hikes at as much elevation as we could conveniently get to, for as long as we could fit into our schedules. We hiked North Table Mountain, Aldefer/Three Sisters (a few times), and White Ranch Park. We started out just hiking, then added in a loaded pack (and sometimes an 11 lb chihuahua on top of that!) to get the full experience. Training was going well, but we had a 2 week trip to Europe in there (sea level, boooo!) that felt like a bit of a reset-button. We only got one more hike in after that (Three Sisters again), and then it was time for the real deal. After going over and over our gear, refining and cutting and double-checking, on Wednesday morning it was time. We got up early, and drove to Copper Mountain which was to be the main staging point for this year’s event. Once there, we got registered and checked in, grabbed some breakfast, and had a look at some of the on-site pop-up shops/displays from the different brands involved. We picked up our registration kits (Passport to be stamped at checkpoints, re-usable trash bag, Grayl water filter, a canister of Primus propane) and when the time came, we lined up, loaded up, and rolled out on buses with everyone else to Montezuma, where we’d start our 3-day trek. As it turned out, we actually unloaded the buses and started the hike from a random parking lot/space that I’d been to before, back in winter when I went snowshoeing one time. Now we were in early summer, so there was no snow, but there was plenty of snow-melt. We got unloaded, grabbed our packs, and hit the trail for a long, steady uphill that lasted for the first few solid hours. At the official start of the trek, we got our passport stamped, then picked up a few Clif bars and headed (quite literally) for the hills. Not too far in, we hit our first unofficial checkpoint, where we got a quick primer on how to use the Grayl. From there it was hours and hours (and approximately 4 miles) straight uphill to our first official checkpoint. We stopped for a cup of soup (chicken noodle or potato cheddar), grabbed some candy, and admired the epic views from the ridge we were trekking along. There was still a lot of ground to cover though, so we didn’t stay too long. A little further on from the checkpoint was the actual highest point for the day, and then it was a long, hard, grind downhill towards our campsite for the night. This downhill section was particularly brutal, since it was an ATV trail, with steep, eroded sides and a lot of loose rocks. Knees and toes were howling by the time we got down to camp in the afternoon. There were two highlights on this section of the trail. First was a random encounter with an older couple and their ATV-riding Pomeranian. As we came around a corner, I had difficulty making sense of what I was seeing. Off the side of the trail, there was a fluff-ball of a Pomeranian, wearing goggles (nay, Doggles) sitting in the middle of a semi-circle of hikers, having its picture taken. Apparently it was the travel-buddy of the couple on the ATVs, and it loved to ride along in a harness whenever they went out on the trail. Next up was a moose-sighting; my first ever in the wild. Right after we dry-crossed a small river (yay log-crossings! ), one of our fellow hikers signaled to us to come over, but keep quiet. When we got over to him, he pointed out a female moose just grazing off the side of the trail. They are such huge and interesting looking animals. I snapped a few pictures, but with the distance, lighting, and amount of vegetation in the way, you can barely even make out a brown patch. After the moose we continued on down, down, down the trail, then hit a large stone quarry/dumping ground of some sort, before turning up a dirt road and heading for our day one camp site. It was unfortunately a pretty uninspiring place to camp (the largest field of mulch you’ve ever seen), but I can totally understand the need to keep the impact of that many people to a minimum, and making it vehicle-accessible for being able to provide amenities like port-a-loos (plush) and bringing in loads of beer! We got in pretty early (maybe 3pm?) so we picked up some cool giveaways (a Morakniv Eldris, Primus plate and cutlery set), grabbed some delicious snacks from chef Kyle Mendenhall (repeat appearance from last year) and a few beers from 10 Barrel Brewing, then set up our tent for the night. That afternoon, we dangled our weary feet in the river, and then spent some time at the Morakniv tent carving Swedish Dala horses (#moracarve). Erika managed to slice 2 of her fingers open (ouch! And lots of blood), but the cuts weren’t actually that bad, and she was a trooper. As the sun got lower, the fire pits were lit, a band played, and we had more food from Mendenhall (delicious, pre-prepared portions of different types of stew, in our case, lamb). Eventually we rolled off to bed with the best intentions of getting up and started early in the morning. On day 2, it somehow took us almost 2 hours from waking up to getting going. On the upside, there was freshly-brewed Ozo coffee to get us moving, so we were well-caffeinated for the hike ahead. It turned out that we really needed it, because it was going to be a very long day (see below for numbers). We had to double-back a bit on a section that we’d hiked the day before, then we connected up with the official Colorado Trail for the rest of the day, and in fact the rest of the trip. We stopped a few miles in to cook and eat some breakfast, but other than that it was mostly a long slog to get through the many miles for the day. This was the longest day, clocking in at around 16 miles of trekking. It also involved a ton of elevation gain (around 3,000′ up and down), plus a lot of the trail was out in the open, and it was hot. Oh, and there wasn’t much water along the trail, so we had to carry most of our own. Oof. Highlights were definitely some of the views on the long descent towards checkpoint 2, and then the amazing views out over Breckenridge right at the switchbacks to get down to town level. Sitting at the small lake right at the edge of town there wasn’t half bad either. After crossing Highway 9 (thanks for the crossing assistance State Troopers! ), we were given the option of unloading our backpacks before finishing up the last couple of miles. We opted to carry our own, and headed off for the final ~2 miles of uphill, in to our campsite for the night. This time the campsite was a little more “wild”, although it was still on a heavily-cleared hill, with a lot of fallen trees, rocks, etc. We found a spot in amongst a small grove of trees, along with a bunch of other people (lots of Big Agnes tents), and set up camp. Then it was time to hang out and chat with other folks, grab a beer, hear a short knife seminar from Johan Skullman (a.k.a. The Man in the Fjällräven Shirt), and then debrief on the last day’s plan. This is where we got a bit of a “shock talk”, and anyone who wasn’t feeling really confident was pretty strongly advised not to complete the full hike on day 3. I think there had been a number of people pulling out, and struggling with the course (especially with the altitude) at this point, and day 3 promised to be pretty demanding. Did I mention I’m stubborn? So I of course decided to go ahead and do the full hike on day 3, despite warnings etc. I’m glad I did. Erika decided not to, since the talk of postholing through snow in particular turned her off. I got up at 4:30 am so that I could get a 5:30 start, to avoid melting snow/ice, and get to the other end by a reasonable time. I unloaded a lot of my gear (staff provided a shuttle to get things to the end of the trek), and completed the hike carrying basically just water and granola bars. After starting out with a bit of a group, I mostly hiked with Jack again (who I trekked most of a full day last year with), and we got through it without too much trouble. It was certainly steep; both up and down. There was definitely snow (more like ice). It was long. It was hot at times. Some parts of the ascent really took the breath out of you. The descent was long and steep. But the views were totally worth it. Absolutely epic views in both directions from Tenmile Range. Pictures don’t remotely do the views justice. Once we got down from there, we hit our final checkpoint, where we were treated to bacon and pancakes with lingonberry jam. So delicious. That’s where I met up with Erika again, and then we completed the final ~1.5 miles together. That last little section for some reason was really rough, after feeling like we’d finished at the last checkpoint. Probably also because of the blisters. Rolling in to the finish line was glorious though, and we were greeted with cheers, a medal, a t-shirt, and lots and lots of food, beer, and music. Later that night, we even got an advanced screening of the official trip video, which was already well under way. After that, we crashed early (stayed at Copper Mountain), and then on Saturday morning we made our way back to reality, and back to Denver to recover. I wore my Fitbit Blaze the entire time, and here is what it says about each day. Note that this includes any and all walking around at camp, calories burned while sleeping, etc. Day One: 34,498 steps, 17.17 miles, 5,376 calories burned. Day Two: 44,969 steps, 22.38 miles, 6,079 calories burned. Day Three: 42,701 steps, 21.25 miles, 5,743 calories burned. Total over three days: 122,168 steps, 60.8 miles (97.8 km), 17,198 calories burned. Here’s a map I put together using the amazing Caltopo (absolutely love that thing!). I tried to tweak things to reflect the trails we actually took, although I might be off in some places. Below it is a screenshot showing the elevation profile of each day as well  (you can get an interactive version of that through the Caltopo site). Day One: 10.35 miles, +3,037′, -2,302′ (elevation gain/loss). Day Two: 16.14 miles, +2,859′, -3,043′. Day Three: 13 miles, +3,567′, -3,322′. Total over three days: 39.49 miles (63.6 km), +9,463′, -8,667′. This year’s Classic was quite different to last year’s. It felt much better organized (better trail markings, more coordinated efforts, better map, more facilities, everyone just seemed to know what was going on), but things like trail mileage were still pretty far out, and giving people an opt-out on the last day felt a bit weird. The event hopefully had less negative impact on the environment (port-a-loos, not really wild camping, etc), but that meant a bit less of a real backcountry experience. The people were amazing as always (met some new friends, re-connected with those from last year). The hike itself was a lot longer and harder. I survived, but I got some ugly blisters on the last day. I was exhausted. I know it would have been really hard for some people (especially those coming from sea-level), and that doesn’t really feel like what they’re going for on the Classic. Erika was bummed that she didn’t come on the last day’s hike, and I do think she’d have made it. I don’t know if I could have done it with my full pack, or if I had, how much longer it would have taken me. The free stuff this year was a nice surprise (especially the Morakniv Eldris! ), although I was a little sad not to get the fabric patch like last year (was looking forward to sewing it onto my backpack with the other one). I’m very glad to get a Grayl to replace the one I lost from last year; they’re a really impressive little device. Overall, the Classic was really well organized, and is an amazing event. I’ll be signing up again next year, and hopefully seeing a lot of the same people from the first one. This trip has also inspired me to look at backpacking some more of the Colorado Trail with Erika, since it’s absolutely beautiful, and seems pretty accessible for the most part. For now, it’s time to relax and recover a bit, let my blisters heal… then probably go climb a 14er or something. More pics available on Instagram, or via #fjallravenclassicusa on my lifestream. Also check out everyone’s pics on Instagram.